The German cruise line Aida Cruises has announced the name of it’s upcoming ship. The ship will be called Aidaprima which is currently being constructed at the Mitsubishi shipyard in Japan. Aidaprima will launch in 2015 and will sail year round from the Germany port of Hamburg. Normal Sailings will begin on June 20th 2015. The very first voyager will be from Yokohama, Japan to Hamburg, Germany from March 22nd to June 16th. Another ship which will be the same class is also to be built in Japan. The second ship will be the same class launching in 2016. Both ships are a new a generation and are set to bring a new design. 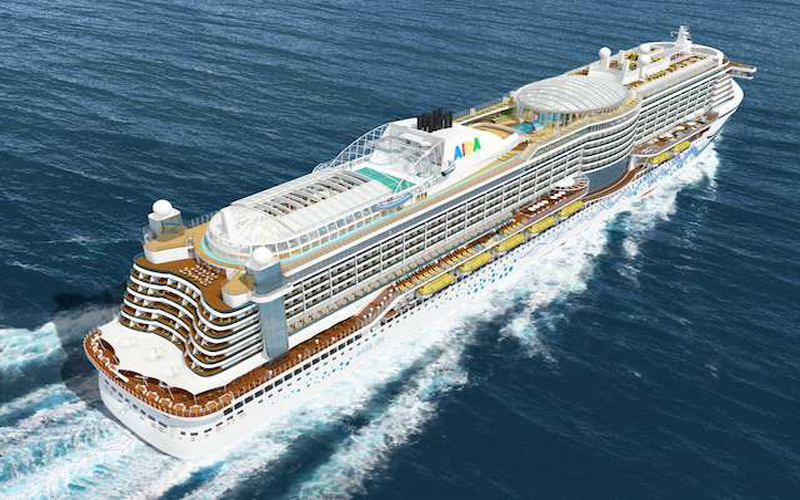 It;s a new era for the cruise line which will also bring new onboard features for the German and European market. Aidaprima will be 124,500 tons and will carry 3,300 passengers. It makes the new ship larger than any other in the Aida fleet. The new ship will bring lots of new spaces and lounges. One new area is the “activity deck” which is dedicated to the planets natural resources including earth, air, water and fire. So there will be different areas for kids which dedicate to the themes. The beach club is a perfect place for passengers to chillout in the day and then party through the night! The place will transform and offers drinks day and night. There are many new bars, special spaces and dining areas on the new ship which should help Aidas parent company Carnival Cruise Lines with it’s recent decline in profits. Let us know what you think of this new ship in the comments below.